A balanced, nutritious diet during pregnancy is important to maintain your health and nourish your baby. Follow Canada’s Food Guide and focus on eating vegetables and fruit, grain products, milk and alternatives, and meat and alternatives. Limit sugary and high-fat foods. Almost all pregnant women need to get more protein, more of certain vitamins and minerals such as folic acid and iron, and more calories (for energy). If your diet is poor to begin with, making the transition to eating nutritious meals is one of the best things you can do for your baby’s health. Eating a variety of foods can help you get all the nutrients you need. Your body needs protein, carbohydrate, and fats for energy. Research shows that women who take vitamins that contain folic acid may lower the risk that their baby will be born with a birth defect called a neural tube defect. Between two to four babies out of every 1,000 babies born in Canada have neural tube defects. You can start taking folic acid prior to becoming pregnant for peak effectiveness. If you have not been taking folic acid, start taking it as soon as you find out that you are pregnant. Note that most natural food products (herbal supplements) have not been tested for safety in pregnancy; it’s a good idea to check with your doctor about any medicines or pharmaceuticals you intend to use during pregnancy. 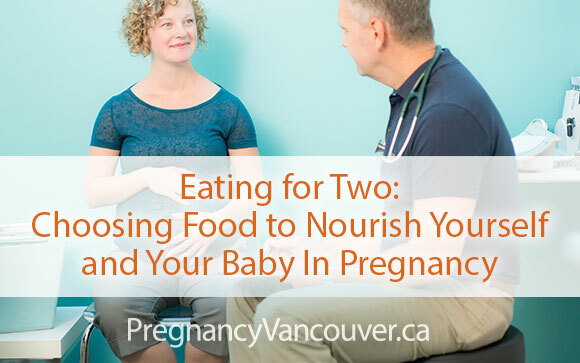 Dieting during pregnancy is potentially hazardous to you and your baby. Many weight-loss regimes are likely to leave you low not only on calories, but also on iron, folic acid, and other important vitamins and minerals. The timing of when you put on weight in pregnancy may be as important as the total number of kilograms. The amount of ideal weight gain for your pregnancy depends on your pre-pregnancy weight and your height. Women who are not overweight or underweight should gain about 25-35 pounds during pregnancy.